It’s the popular electronic Bop It! game that kids love with a “twist”. Never played Bop It? It’s so much fun! Players press and twist his head, and pull his legs to play the game. Sort of like a Simon says! 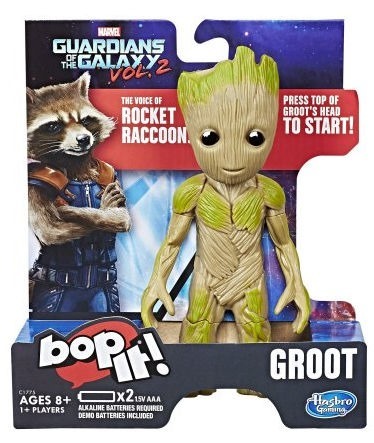 It also combines the sounds of Rocket Raccoon with classic Bop It! Players try to keep up with the commands, but when they hear the unit call out “Pass it,” it’s time to pass the game to the next person. Great for playing with friends, or players can also challenge their own personal best in solo mode. My boys (Ages 7-9) love these little Bop It! games & try to outdo each other’s best score. At this price it would make the perfect stocking stuffer! Remember to Sign In or Sign Up for Ebates before you shop online! Disclosure: This post contains affiliate links. All monies made through such links go back into the running of the First-Time-Mommy Facebook page & website.